With a strong heritage of literature and an impressive historical background, Burford Bridge, a beautiful 57 room hotel located at the foot of Box Hill in Dorking, is an idyllic romantic setting to host both a wedding ceremony and a celebration in Surrey. Lovers of literature, drama and poetry will appreciate an underlying classical theme. In addition to rooms being named after famous authors and playwrights – William Wordsworth, Jane Austen and Richard Sheridan – subtle hints of the hotel’s famous local connections present themselves in unusual ways. Notice the lobby chairs which feature works of Keats or quotations from Jane Austen’s ‘Emma’ on the restaurant wall. A modern mixed media piece inspired by place mats given by Lord Nelson after his stay at the hotel also adds to the unique historical charm of this delightful Surrey venue. Burford Bridge hotel is licensed to hold civil ceremonies and partnerships in two of its function suites and the surrounding landscaped gardens offer wonderful opportunities for both outdoor refreshments and also for capturing stunning wedding photographs. 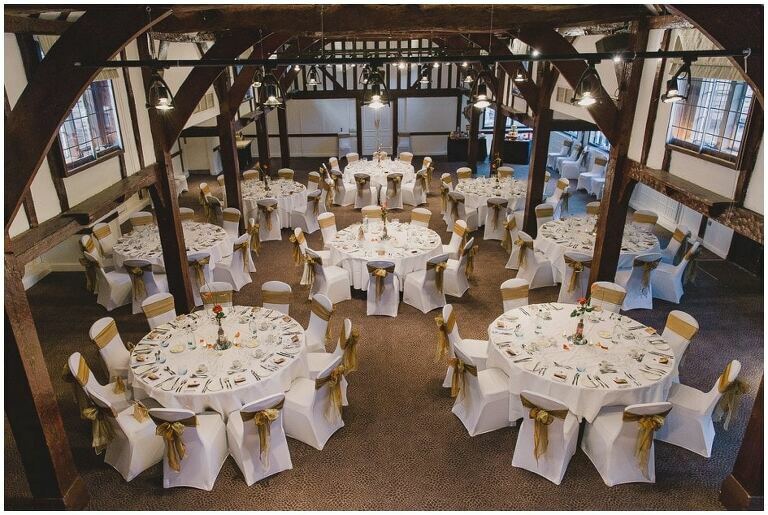 The medieval Tithe Barn, with its high vaulted ceilings and rustic oak beams said to have been built from timber taken from the Spanish Armada, is a spectacular, yet versatile, space to hold ceremonies and celebrations. French doors lead out onto spacious gardens and with an ability to accommodate up to 200 guests, the Tithe Barn is perfect for larger wedding parties. For smaller, more intimate occasions, the elegant Garden Room, accommodating up to 55 guests, features French doors leading onto a private patio and garden area and is an extremely picturesque spot to capture treasured moments. Its location, being separate from the main hotel, gives it a private and more exclusive feel. Alternatively, smaller rooms are also available, catering for up to 30 guests, all of which provide panoramic views over the stunning Surrey landscape. Burford Bridge provides a comprehensive wedding package service which will complement all themes and suit all budgets. Whether you’d like to greet your guests from a red carpeted entry point or hire the services of a professional toast master, the team of wedding planners are on hand to discuss individual requirements and provide the personal touch to make your day complete. Similarly, the talented chefs provide a broad selection of top quality wedding breakfast and evening buffet menu options. From traditional six course cuisine through to barbecues, hog roasts and lighter buffet style catering, all tastes, budgets, age groups and dietary needs are easily accommodated with delicious, freshly sourced seasonal ingredients and produce. A tasting session for the bride and groom is included in the majority of wedding packages. Standard hotel packages include luxurious accommodation for the bride and groom as well as discounts for wedding party guests. There are a selection of 57 luxurious en suite rooms, all furnished to a contemporary style with comfort and convenience in mind. Air conditioning, flat screen TV, wifi, ironing facilities and 24-hour room service are also included and guests are able to enjoy exclusive use of the extensive grounds, bars and swimming pool. The combination of beautiful surroundings, historic architecture and ease of access to London and the south all contribute to Burford Bridge being an ideal location for wedding day dreams to transform into reality and a day for family and friends to treasure. Still not found that perfect venue? Why not take a look at some of the other lovely wedding venues I’ve photographed in Surrey? If you’d like to enquire about my availability for Burford Bridge please get in touch here.